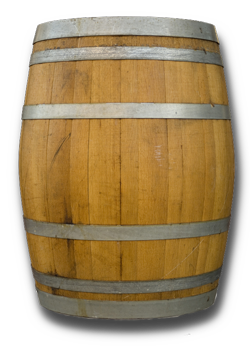 As late as the early 1900’s, barrels were the primary container for the transport of oils, flour, pickles, salt, beer, spirits and wine. But today wood barrels are used almost exclusively in the production of wine; a return to their origins when the Celts invented the art of barrel making, or “Cooperage” during the Iron Age (750bc to 43 AD) to replace the ancient amphorae used by the Greeks and Italians. 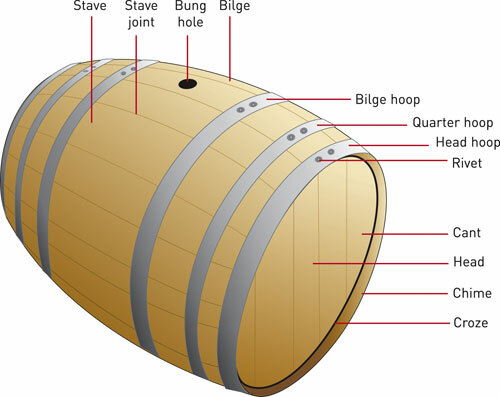 Modern technology has made production of wine barrels faster and more consistent, but cooperage remains a skillful craft…the wood staves (the vertical slats bound by metal bands) in each barrel must fit water-tight without the use of glues, liners or metal which would react with the wine inside. In addition, the woods used are hand-selected from specifically desired 80-100 year old oak trees and forests throughout the world, since barrels impart color, aroma and flavors (oak, vanillin, clove, cinnamon, chocolate, nutmeg, etc.). The selection of wood is as important to the cooper as selection of grapes is to the winemaker. For instance, the French forests in Burgundy grow slower in a cooler climate, creating a finer grained hardwood, which specifically suits the aging of certain wines. American species oak trees impart a tell-tale sweeter oak flavor with coconut and vanilla overtones and less tannin than European woods, due in part because of 2-4x the amount of “Lactones” present in the woods grown here. Barrels also facilitate a breathing process between the outside environment (air) and the wine and spirits, causing alcohol and water to evaporate through the staves (up to 4% of the volume over a year’s timeframe), concentrating the wine and spirits. It’s the breathing process that helps integrate the wine and that is partially responsible for a wine’s harmony. Because the craft of cooperage is so important to the final wines produced inside, many larger wineries insist on producing their own barrels at the winery…Maison Latour crafts over 2000 barrels annually with traditional methods used there since the middle ages. To produce a barrel, first the wood is selected and cut to shape. The staves are then dried outside for several years to allow impurities and undesirable odors in the woods to air out and allow the harsher tannins present in the oak to dissipate. Staves of proper size are then steamed (to allow bending) while being assembled and wrapped with steel bands, then “toasted” with a flame inside to further soften any tannins present and impart toast, coffee or caramelized qualities. The barrel is then finished with ends, called “heads” and with river reed parts where needed for water-tight seals. As production methods improve in the U.S. (as American coopers adopt French methods and reject old whiskey-barrel methods), American barrels continue to rise in worldwide acceptance. But French barrels still command far higher prices ($700 for French, $300 for American). Watch a video of the Louis Latour barrel making tradition. See a scrapbook of historical barrel making photos from the past century.